Backbends are such exhilarating postures. Not only do they require strength, flexibility, and perseverance, but they also tend to bring up any fear you have right up to the surface! Below are the three of my own personal lessons I’ve learnt on my journey in drop backs so far. It’s amazing how backbends can bring up so much fear. And drop backs are probably one of the most scary. It's a scary sensation to bend backwards as far as you can from a standing position, release your hands back into space, with the hope that you will land in a safe upward bow and you will not crash your head hard onto the ground! For a few months, my teacher would often say that I was “more than capable to do the posture, but your mind is holding you back”. And for months, I would get so nervous before each backbend, and freeze mid air, with this fear that I would crash and fall. I began to notice that as soon as my mind acknowledged the fear, my body would stiffen and I found it difficult to move in the posture. Fear literally paralysed me mid-back bend. It made me stiff, rigid and clunky, and although my back was open enough, the fear brought so much doubt and I would convince myself that my body wasn't open and that I was nowhere near being able to move into it. 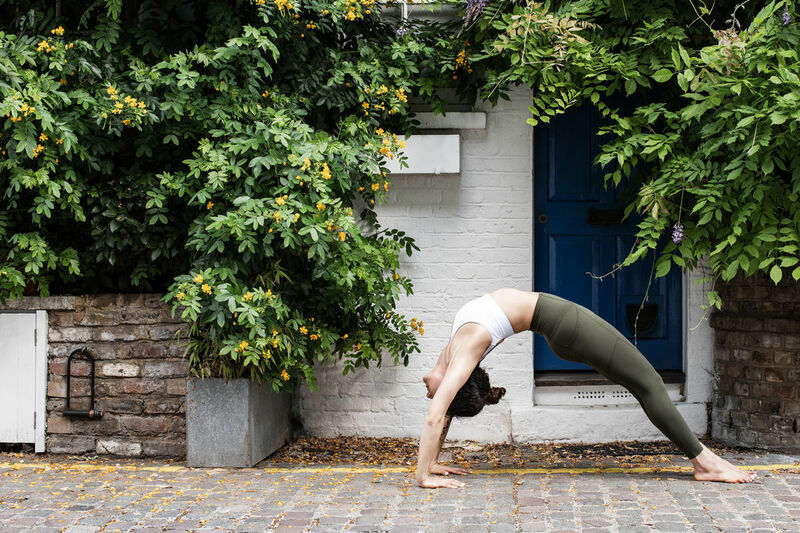 While this fear is not always rational, backbends can often make you acutely aware of the intensity of it and make you question why it is there in the first place. After ten months of daily practice, I began to be aware of how strong its pull was and made a decision that I would no longer acknowledge the fear, but rather would listen and repeat the words my teacher would say, being " you can do it, your body is already so open”. Repeating those words helped me to push past the fear and have faith and trust in myself that I could do it. And that’s exactly what happened! It’s a powerful realisation to know that we all have the ability to completely control our own mind. It’s up to us to choose to open the door or close the door to fearful thoughts and their paralysing impact. When I am working towards a yoga posture, I (nearly always!) use the power of visualisation to help me achieve it. Personally, I’ve found drop backs and backbends difficult, as it’s been hard for me to gain an awareness of my body in space when I’m not completely upright. My teacher would often give me instructions while I was physically in a backbend, and for some strange reason, it would sound like complete gibberish & I wasn’t able to execute any of her instructions! To gain more of an awareness of my body in drop backs, I would use as much imagery as I could find on the internet to create and cement a solid picture in my mind of what the posture would look like. I would do this every morning for a few minutes just before I started my own yoga practice. I found doing this just before my own practice to be the most impactful. The more I looked at videos and images, the more I noticed the small details in the technique. Over time, and strangely enough, this repetition of imagery helped me create an emotional connection to the posture, and I could almost feel how amazing it would be to open up my chest so freely when I was able to do the posture. When I’d hop on my own yoga mat, I know that this imagery helped me progress into doing a drop back on my own. Napoleon Hill once said “all thought has a tendency to clothe itself in its physical equivalent”. And I believe the power of visualisation and using the mind in this way can definitely help! For nine months, I was using the same technique to move into drop backs. While my teacher was away at a retreat, a substitute yoga teacher came in and begun assisting me in the posture. There were two very small but very impactful instructions she gave that enabled me to move away from working in my lower back, and feel a lightness in a drop back. Two small instructions changed my backbends from feeling clunky and stiff, to feeling soft and open. The biggest thing I noticed was how much of an impact (and how quickly!) a small change could make in a posture. Always open yourself up to making small adjustments. It’s usually the small changes that make all the difference.